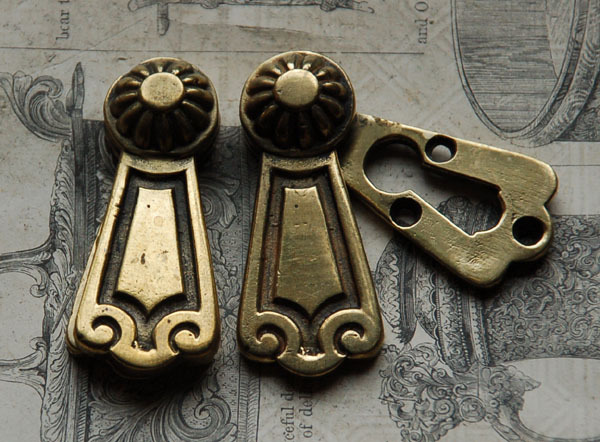 Escutcheon: A decorative metal back plate or flange that surrounds a keyhole, door handle, light switch, etc. It also refers to a similar metal plate that fits over a keyhole and pivots on a pin to expose or hide the hole. In addition, the shield in a coat of arms is called an escutcheon, which sometimes is used as a decorative device on furniture. Beautiful hardware by Franz von Stuck on the entrance to the Council Room at the Bremen City Hall, Germany.